The Botswana Lodge Safari takes you on an epic journey to all the must-see highlights of Botswana. We visit the world famous Okavango Delta, Moremi, Savuti, the Makgadikgadi Salt Pans and of course Chobe. The Botswana lodge safari departs and ends in Johannesburg, South Africa. Included highlights: Kalahari - Bushmen walk in the Kalahari, Private camp in the Okavango Delta, Okavango Delta boat and mokorro trip, Game walks, National Parks (Moremi/ Savuti - 5 Days), Open vehicle Game Drives (safaris) in National Parks, Serviced Camping in National Parks, Makgadikgadi Salt Pans - Night under the Stars, Chobe River Boat Cruise, Victoria Falls National Park. 1. Accommodated (hotels/ lodges): Clients overnight in a comfortable twin rooms or permanent safari tents, mostly with en-suite bathrooms. 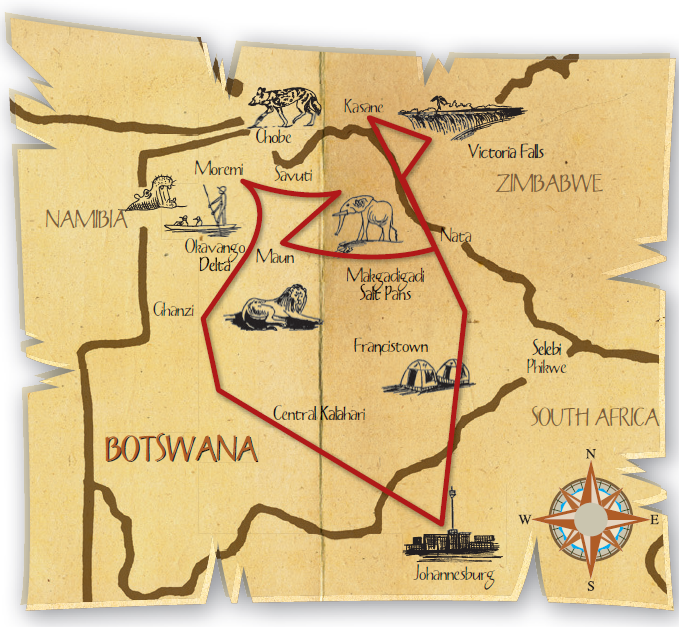 The Botswana lodge safari starts from the lodge in Johannesburg at 06:30. We set off to cross the Botswana border near Lobatse. On completion of Customs and Immigration formalities we pass through an area boasting significant history, then, it’s out into the vast Kalahari Plains. We will cover quite some distance today before arriving at our established overnight camp near Kang. Once we have checked into our accommodation we will enjoy a short walk out into the bush. Tonight we enjoy a catered meal. We begin our journey into the Delta near the so-called panhandle, gliding through papyrus lined channels, first by motorboat and then by mokoro - the traditional dugout canoe, to our exclusive wild island. We spend three nights here in true wilderness, exploring the area on foot and by mokoro. There will also be time to simply relax and to absorb the remoteness and serenity of the area. Depending on the conditions in the national parks we might also venture into the Central Kalahari Game Reserve or the Makgadikgadi Pans National Park. During this part of the journey we camp (serviced camp) in remote, pristine sites where there is no sign of man’s existence. We will make sure we leave each site in the same condition, nothing but footprints in the sand are left for the quiet winds to deal with. Today will have a relaxed start as spend some time enjoying the Lodge and the swimming pool before enjoying Brunch and then venturing eastward and into the spectacular Makgadikgadi Salt Pans. Besides the stark scenery, the Pans are known for their wonderful bird life and some other desert adapted animals. Without disturbing the surface, we take in the isolation and serenity of this expanse. After exploring the pans we continue to our accommodation for the night and enjoy a relaxed evening in comfort. Meals: Breakfast. Lunch and Dinner at own expense. We set off to cross back into Botswana and to continue south toward Francistown. Tonight we stay in comfortable accommodation, enjoying the African night and celebrating our adventure with our last dinner together.